This allows us to focus entirely on optimising the outcomes of our client’s core drilling programs. Our staff have all undertaken the standard West Core Drilling induction process with on-going assessment of competencies in all aspects of the various on-site roles. 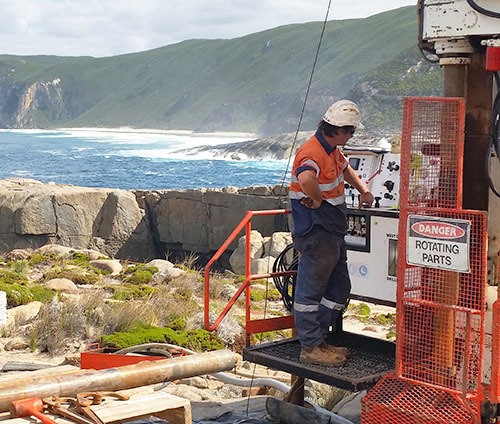 Operating in conjunction with this is the process of official accreditation for our drilling staff; once crew members have completed their probation they commence the skills assessment process leading initially to Certificate II in Drilling Operations. All our most senior crew members are now certified to either Certificate III or IV in Drilling Operations. Our drilling crews are supported by an experienced, specialist drill fitter who spends 25% of his field time with each rig, helping to substantially improve preventative maintenance and reduce down-time. Support and mentoring of the crew is provided by both the General Manager and Supervisor who make regular visits to each rig.